When we heard that the Science Museum had put out a call for people interested in running live games about zombies, it seemed like a bit of a dream come true. 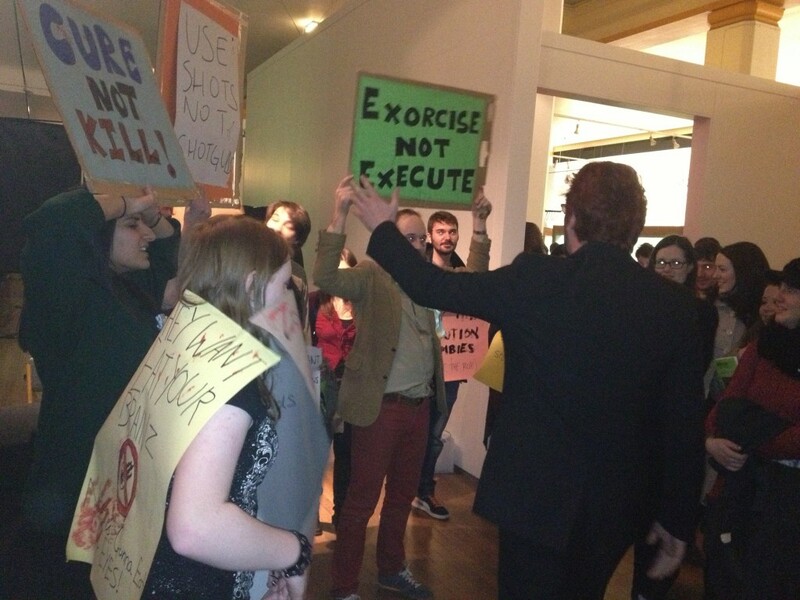 We’ve been staging zombie games for years, and there’s little more exciting than the prospect of running around the actual Science Museum evading zombies and generally having a good time of things. What we ended up running, though, was quite different to most of what we’ve done in the past. The Trial became a game with a very simple voting mechanic but an awful lot of deep narrative to explore. It became a peculiar kind of sociological experiment, an exploration of the ethics and morality that go along with having a zombie virus that can be cured. Me, as Fiona, explaining how I didn’t remember any of it. The frame of the game was fairly simple. Through text display, film and actors, we set up a story: a world where the WK-23 virus had infected significant numbers of people, causing them to exhibit zombie-like behaviour. Set in the later stages of the outbreak, as the virus was being brought under control, the Trial was ostensibly staged by the Community Jury Initiative, which brought two people accused of unpleasant acts in front of the public, and asked them to pass judgement. Fiona, a cured ex-zombie, was accused of killing a man while suffering from WK-23; Clare was accused of killing a zombie, who might one day have been cured had he survived. At the exhibit, we had stacks of cards with statements printed on them – a total of 13 statements, deliberately stark and without nuance. Fiona is guilty of murder. Clare should be released without charge. Zombies should be killed. 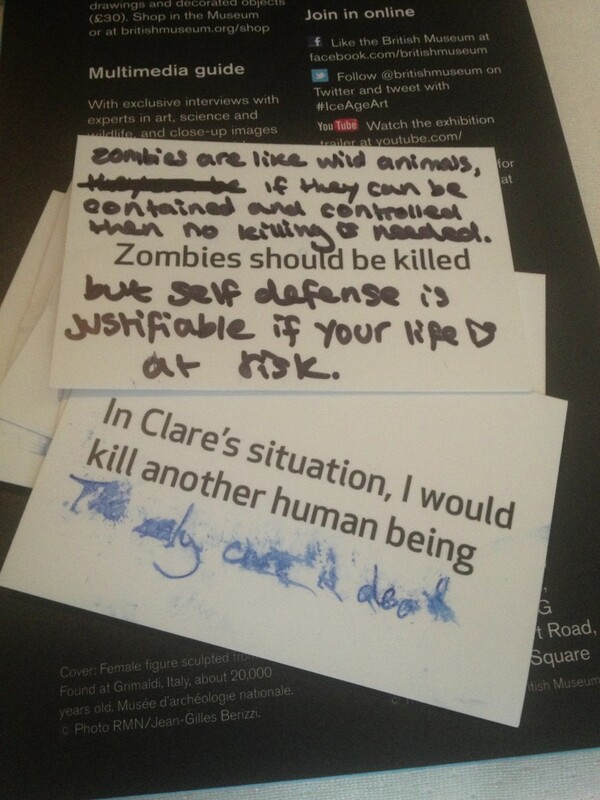 Every entrant into the exhibit received two of these cards, and was then asked to watch a short film showing the attack in which Clare kills a zombie, and Fiona is one of a group of zombies who kill her boyfriend. 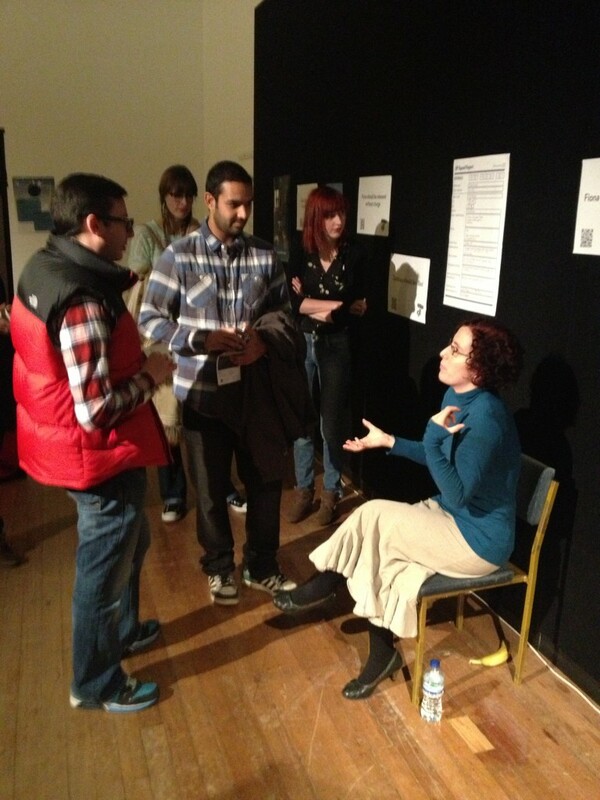 Inside the exhibit were witness statements, posters, factual information about consciousness, the mind and the law, and two actors playing Fiona and Clare (I was Fiona). At the end, we placed two ballot boxes, one marked “agree” and the other “disagree”, into which people placed their statement cards once they’d made up their minds. We counted the verdicts a couple of times each session, to keep the scoreboard online up to date. From my vantage point as Fiona, the experience was fascinating. About a third of the visitors seemed to make their minds up fairly quickly, only perusing the information briefly, and not speaking to the actors at all. Many people read almost all the information we set out, and a few spent a very long time questioning us, poring over posters, and arguing over exactly what we thought about what we had done. One man spent more than half an hour questioning the two of us individually. 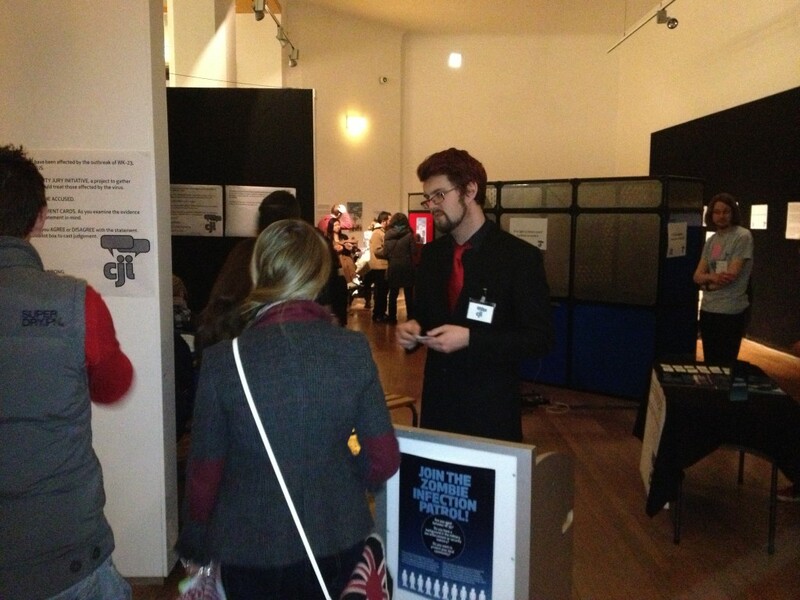 The group dynamics of the game worked best when we were fairly busy – which was a good thing, given that we had about 1,500 visitors in total between Wednesday late and the two weekend days. People are braver in groups; we often found people walking around in silence until someone got up the courage to ask an actor a question; as soon as one person engaged with us, a crowd formed and we would be fielding questions from all directions. I’m indebted to our excellent crew, who both encouraged people to get involved with us, and encouraged them to discuss their thoughts with each other. The fact we were seated on chairs while the visitors were standing genuinely affected the way people spoke to us, and the power they felt they had to question and to interrogate. 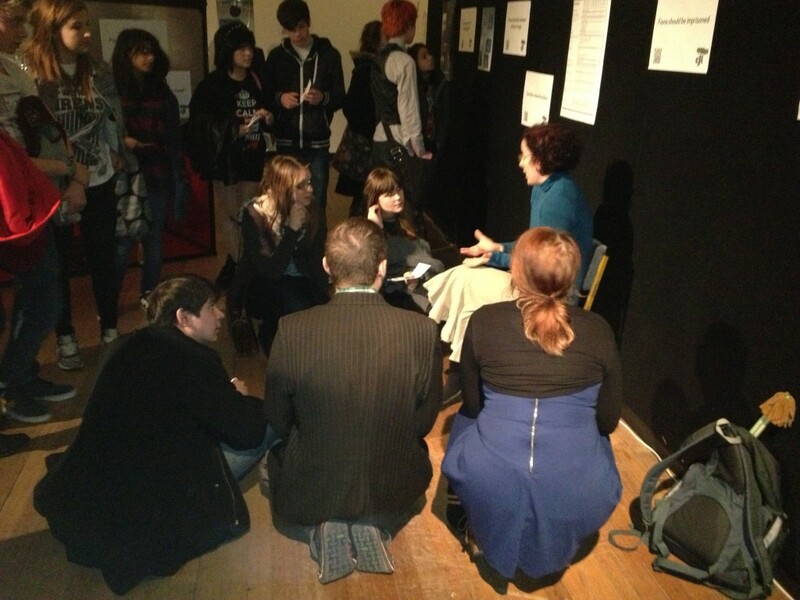 Only once in the whole weekend did someone crouch down to get on the same level as me – but that ended up with me as Fiona explaining events to a group of ten or fifteen adults, sitting cross-legged on the floor around me. The strength of emotion involved genuinely surprised me, as did the level of disagreement. Groups had heated arguments about which of us was guilty, if either. Some people flung insults at me as they walked past; others patted my shoulder and told me it was all going to be fine. Couples argued. Friends disagreed. One girl spent ten minutes trying to get me to agree that zombies were basically just like bears. A father encouraged his two sons to ask very serious questions, very carefully, before they decided together how to vote. And even though we deliberately put out no pens, a few people felt strongly enough about the ambiguity of the scenario that they found their own and wrote on the cards we gave them, so they could make their own responses. I was very proud of the event. I owe a big thank you to Chris Farnell, who wrote an enormous amount of material for the game, Alina Sandu, who made it look gorgeous, Ellen Clegg, who played Clare and became increasingly Daily Mail as the weekend progressed, Grant Howitt, who was front of house and wrote background and script, and George Seed and Matt Barnes, who crewed the event and gave me the most appropriate and necessary coffee of my life thus far. We got people talking – we made something serious, something big and difficult, and in the middle of a massively fun and light-hearted event we asked people to think about a complex, tricky issue. They responded wonderfully well, with nuanced thinking, complicated questioning, role-play, interest, and intelligence. And in the end, it transpired – terrifyingly – 67% of people who were asked said they’d kill another human being, if that human was a zombie at the time. I think that’s valuable to know.